Tracey-Lynn Miller of Fred She Said Designs brings us the sweetest little baker - adorable for any occasion. 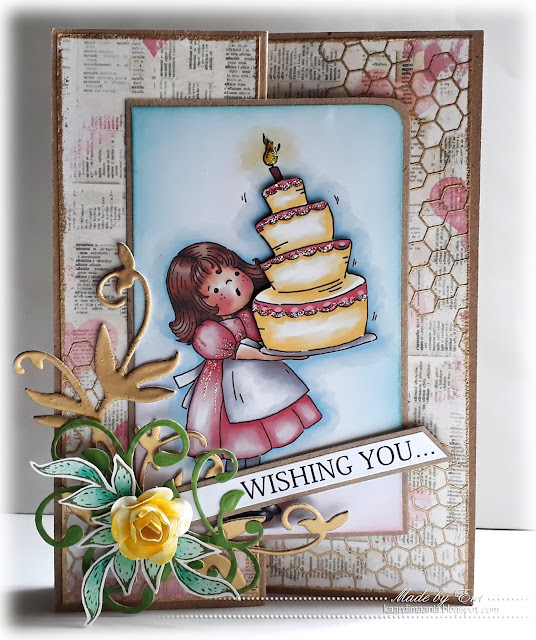 Darling birds join in Emma’s happy wishes, or cause a little mischief and chaos – whichever the crafter wants to portray. Sentiments are courtesy of Sparkle N Sprinkle. Because we offer fine, transparent PNG files in addition to JPG files, you will easily be able to create digital scenes on your word processor, and place the sentiments, exactly where you’d like them to appear, and in the sizes that work for your designs. As a bonus, you will receive all five colors in both JPG and PNG format, with and without the blue background. As always, you’ll receive traditional black-and-white images for you to color. Coordinate with our other fine digital sets and papers, especially the coordinating “Watercolor digital papers” (links below). Combine the digital set with any of our stylish digital paper packs, or use the digital images more traditionally by printing, coloring and layering as you would any of your pretty stamped projects. Design tip: Use your “tools” to flip your images horizontally. Print a smaller version for the interior of your card. Print out the images multiple times and decoupage a “pop-up” layered appearance. 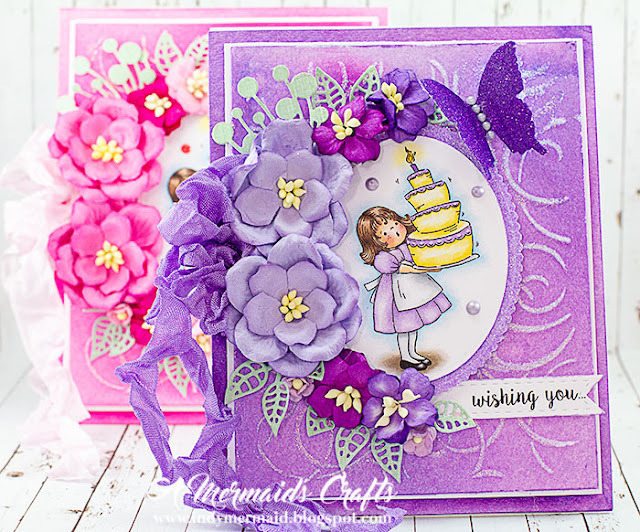 For the Rubber Stamp of “Emma’s Best Birthday”, please click here. Most US based orders are shipped directly from our warehouse within 24-48 hrs for your convenience and maximum efficiency. Your product will arrive within 7 to 10 Business Days. All International (Non-US) orders incur a $25 shipping charge which are shipped via standard US Mail and may take 2-3 weeks to arrive. Sparkle N Sprinkle offers the following Returns Policy: We happily accept returns or exchanges on defective merchandise and will reimburse you 100% of the item cost & shipping. Please be certain of your selections before making payment. The product returned must be new and unopened. For all order discrepancies, as well as returns and exchanges, you must contact us within 30 days of order receipt. Sparkle N Sprinkle ships worldwide. Sparkle N Sprinkle is not responsible for any parcels that are lost or damaged once the parcel has left our warehouse. Certain items in our store such as machines are marked as oversized and an international surcharge is noted. Each country's customs department reserves the right to inspect parcels and an inspection could delay the transit time of your order. In addition, we cannot guarantee that tracking information will be updated regularly on the USPS web site. Sparkle N Sprinkle is one of the world's leading Glitter and Embossing Powder Manufacturers as well as providing many other Brands great products. We have many great reasons to buy from us. We are a fast growing company because we always put the customer first. A customer-centered shopping experience has always been our goal and we pride ourselves in our comprehensive policies that have put us in a realm above and beyond our competitors. Shop with us today and see the Sparkle N Sprinkle experience. 100% Satisfaction Money back guarantee. Everyone that uses our products, come back for more. We must be doing something right! The bottom line is we love our customers, and our customers love our products! Take a selfie with our product...post it and tag #SparklenSprinkle to FB or IG and email it to Sales@SparklenSprinkle.net to win! Join the SNS CLUB for new videos, discount codes, and more! JOIN THE SNS CLUB Today! Copyright © Sparkle N Sprinkle. All rights reserved.